When I started embroidering this pincushion, I was inspired by one of my favorite, but infrequently heard Christmas carols, where Christ is referred to as the Christmas Rose. In addition to the larger rose on top, there is a smaller seam of roses along one side. 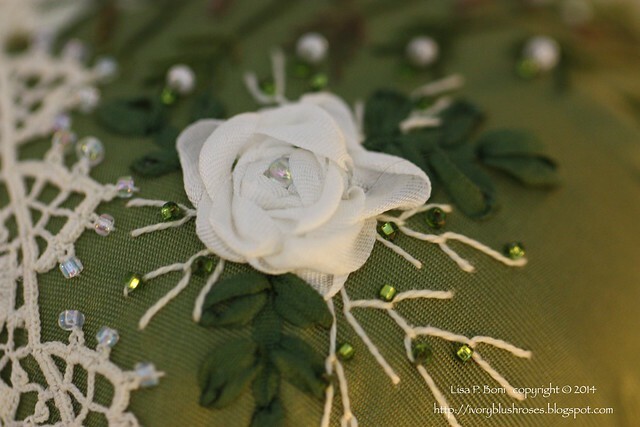 A lovely piece of old Irish lace has a rose motif. 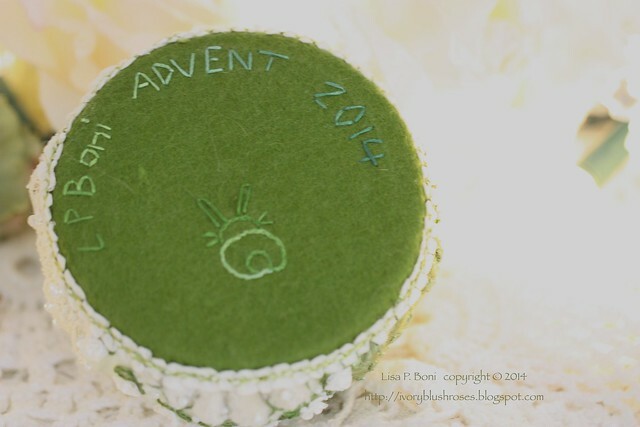 As with the previous two Advent Pincushions, please leave a comment on this post to enter a drawing to win this pincushion! Entries close at midnight, Mountain Standard Time on Saturday the 20th! Only one comment from each person will be counted, and those who have won previously will not be included in the drawing. Entries will be numbered and a random number generator will be used to choose the winner (and a runner up in the event that the original winner does not respond with their mailing info in a timely manner.) Winner will be announced on Sunday! 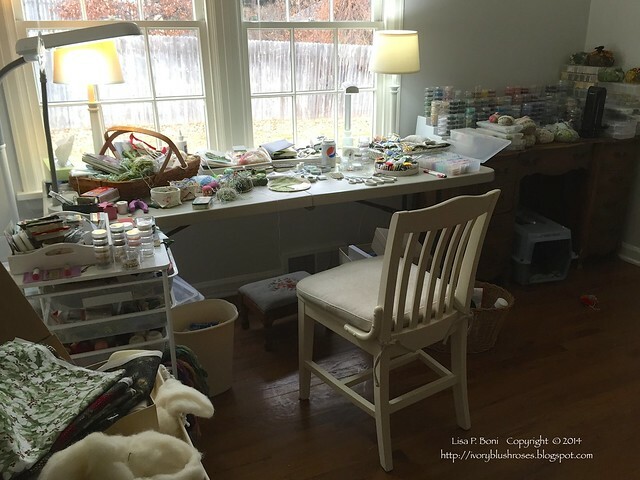 I have moved into my new stitching space, though I am still working around some of my daughter's furniture. It is a light, bright space and I have a bit more room to spread out! The room will continue to evolve once Jessie is able to get her furniture out! Miss Kitzy Cat is happy to have me in her space more often and has actually been brave enough to venture out into other parts of the house since I started spending more time in there with her! On the mantel, I decorated with 5 white nativity sets, some small trees and candles against a backdrop of a faux boxwood garland. The dining room has views to all four trees! Down the hallway to the right of this photo, you can also see my bedroom tree! 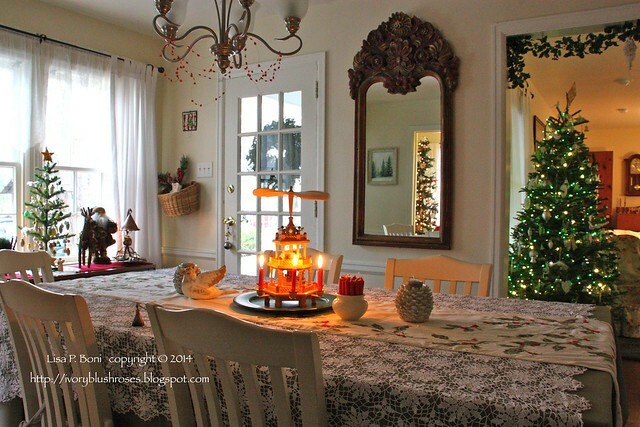 The little faux feather tree remains one of my favorites, year after year. 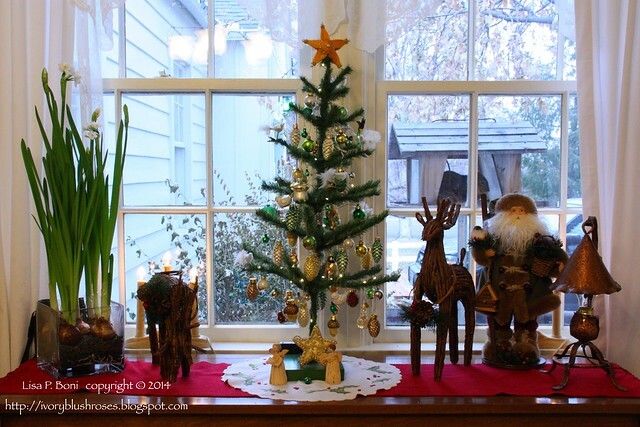 It's nearly always decorated with an assortment of tiny pinecone and acorn ornaments and tiny balls and little woodland critters. The bedroom tree is a memory tree of sorts this year. I put out all the ornaments that I have had since I was a child. Most of them were given to me by my Mom or friends and some belonged to my Grandma Plooster. I hadn't put them out in years. What fun it was to go through the boxes and relive some lovely memories! 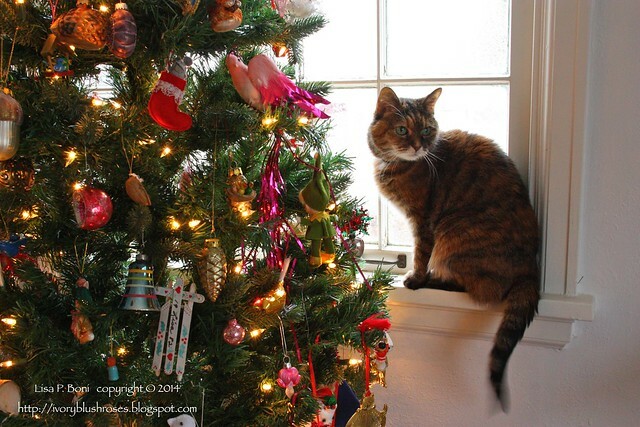 Mollie Kitty likes this tree too and can be found curled up underneath it or sitting on the windowsill next to it! The tree in the "studio" aka breakfast nook has a snowflake and redbird theme this year! 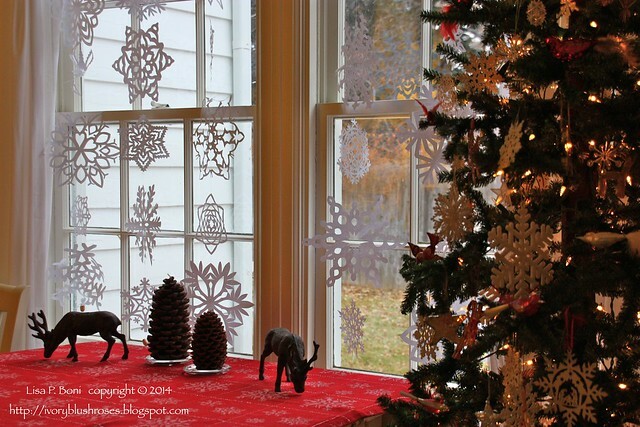 I had fun learning to cut paper snowflakes this year to hang in the window! The top of the china cabinet hold the olive wood nativity set that my Mom brought back from her trip to Israel in the late 70s. She also did the painting hanging above it. The little white shelf in my bedroom has it's annual decoration of tiny bottle brush trees and miniature nativity sets! Thomas thinks he is a Christmas decoration too and insists on sitting on the corner of the dining room table, even though he isn't supposed to be there! Your home is beautiful Lisa! I don't do any decorating as I live so far from my family. We have very little company so I don't bother. Once we get back to Alabama, I plan to start decorating as I did when my girls were growing up. I miss the spirit of the season. Very beautiful house and pincushion. A looks like a happy cat. What a beautiful pincushion and I loved the songs that went with it. please enter me in the drawing. Your house is so lovely with all the trees and special decorations. It must have been a true joy reliving old memories. Thank you for sharing the pics with us. Once again you have created a wonderful pincushion. I love the green and white theme. Our Choir sang Jesu Bambino in our Christmas concert last year, it is such a beautiful piece. Thanks for counting me in for the giveaway. Beautiful,= house, beautiful trees and beautiful pin cushion! Each new pincushion becomes my new favorite. This one is especially lovely with the roses. Have a very Merry Christmas in your new house and with your family. Your pincushion is beautiful! Your stitching is perfect! And,your home is lovely! Thank you! Beautiful home and lovely pincushion. I love that you have so many things in your home that are passed down from loved ones. I only have a few things but they do keep loved ones in my memory. Thank you for sharing your home and your art with us. I love your home and Christmas decorations. What a wonderful pin cushion! Thanks for the chance to win! thank you for the tour of your home. I love seeing all the Christmas decorations. I'm just learning SRE and your work is awesome. Thank you for sharing. Lisa, you have a beautiful home and Christmas decorations are lovely. I love your beautiful pinchusion. I enjoy your hymns. Many are familiar from my days singing in the choir for many years. I hope you and your family have a very blessed Christmas. Thanks for the inspiration. I love your blog - your house is lovely. Looks so comfortable, well decorated and lived in. I am amazed at how much you get done. I love the pincushion and if I'm lucky enough to get it will cherish it. I am making my first one now. Wishing you and your family a wonderful Christmas and a New Year. Your blog is such a delight to see. I love your beautiful pin cushions and all your beautiful trees in your rooms. A sight to behold. Thank you for the wonderful eye candy. I hope my name is drawn for the pin cushion. I always enjoy reading your blog, and seeing your beautiful stitching and photography. 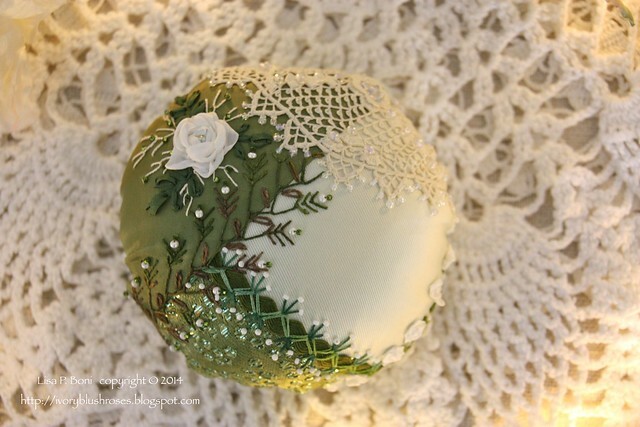 It would be a joy to own one of your pincushions--this one is lovely. 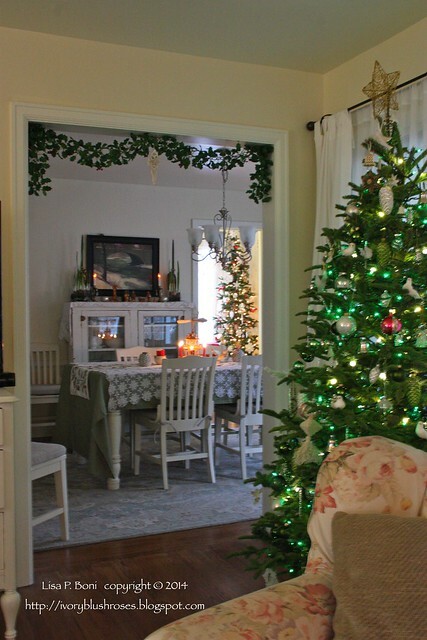 Lisa, thank you for sharing the beautiful pictures of your work and especially the gorgeous decorating you did on your home. It is lovely! I love reading your blog! Your pincushions are beautiful!!! Have a Blessed Christmas and a wonderful New Year! Lisa your home is looking absolutely lovely! 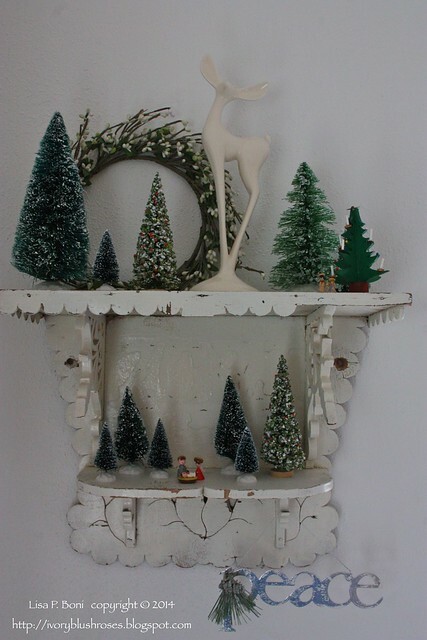 I love the way you Jane your decorations themed in different areas - that little white shelf is particularly lovely. All of your pincushions are so lovely - thanks so much for the opportunity to win one. Merry Christmas! Autocorrect struck there - I meant that your decorations are themed not Jane! 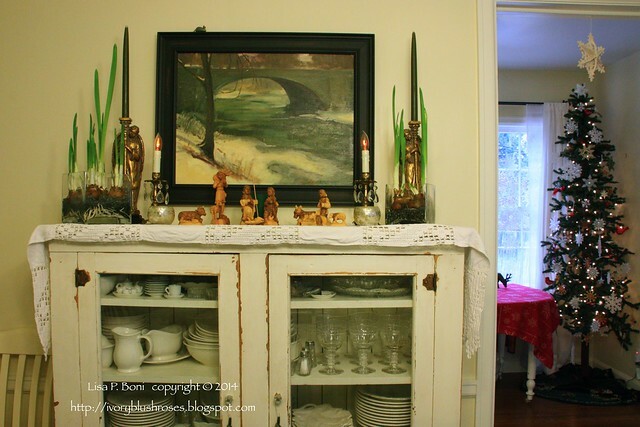 Dear Lisa ~ I love how you have decorated your home. It is all lovely and peaceful! I love the painting your Mom did. Your cats are adorable on their various perches. 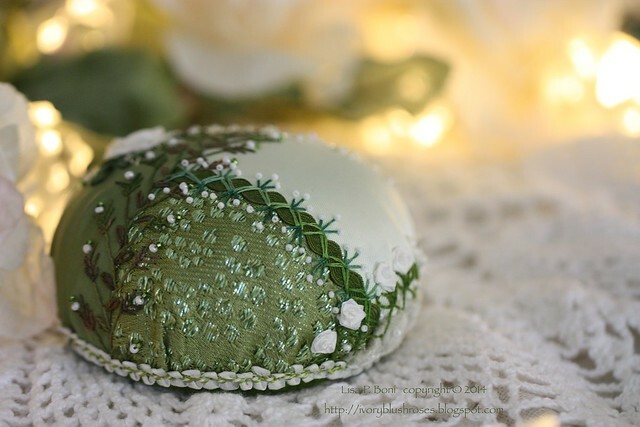 That pincushion is really pretty and I hope to be the happy winner of it. Time will tell. I've never heard of either Christmas carol and enjoyed the words of both. Thank you for sharing. 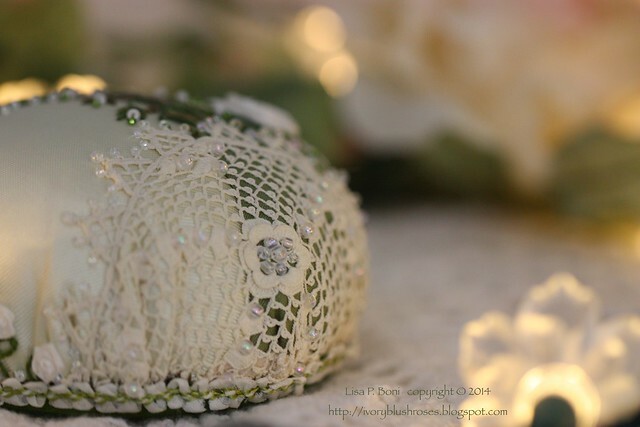 What an absolutely beautiful home, Lisa...and a gorgeous pincushion! I would be thrilled and proud to own it. Your home is lovely and your needlework is lovely as well. Happy Christmas to you and yours. Lovely pin cushion. 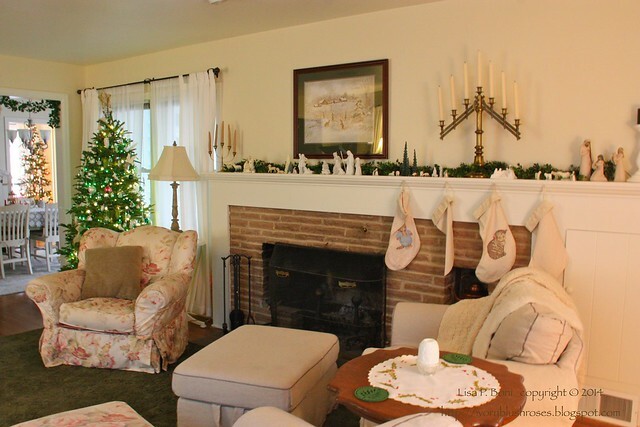 Your home is warm, inviting and decorated beautifully! Love your decorating skills! The pin cushion is fabulous. Love the photos and decorations. I especially like the cat, window and tree composition. My grandmother's house has been empty for 35 years. A cousin has begun some restoration work. It is a farm house --not grand by any means. This year despite being empty, there are candles in the windows. On the door a wonderful wreath of twigs and holly gathered from the yard. That made another wonderful photo. 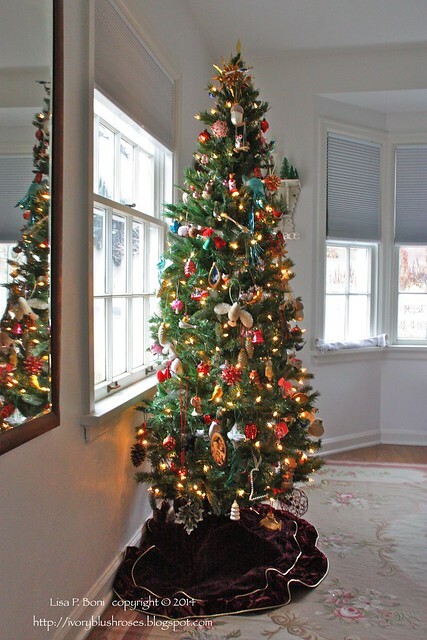 Your home looks so lovely with all your pretty Christmas decorations! 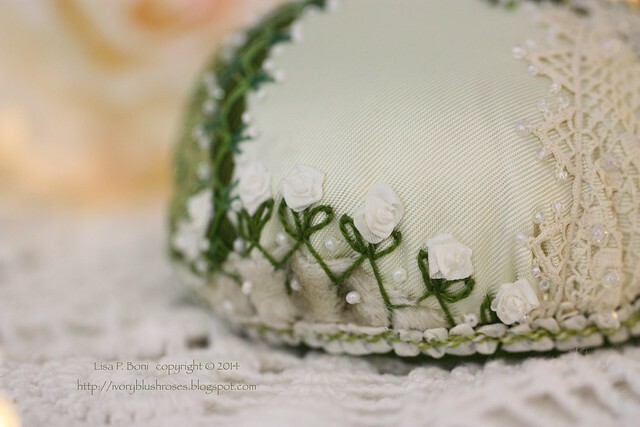 I'm currently working on a rose themed project so it was fun to see your latest pincushion. Please don't enter me in the drawing. Just wanted to say how beautiful your home is. You have the decorating knack and Christmas really shows it off. Wish I could come visit. Another beautiful pincushion! Thank you for sharing pictures of your jewel box house, it is encouraging me to make my house "my own". What an exquistely beautiful pincushion, just found my way here via Jude Hill's Small Journeys! 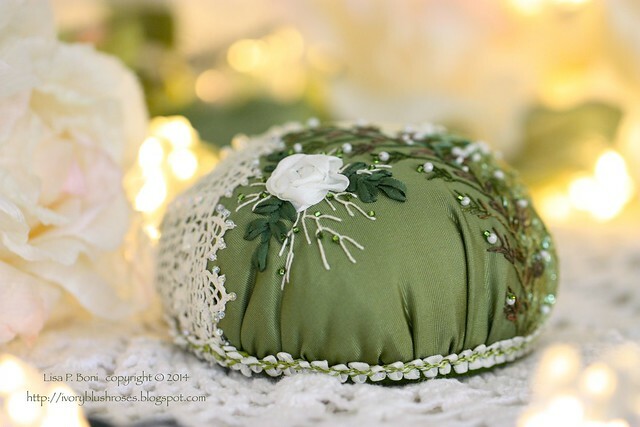 Once again a beautiful pincushion and I absolutely love the way you decorated your home. Enjoy Christmas! Love to look at your pin cushions and your house is so pretty! The pincushion is stunningly beautiful!!! I love how you tie the rose to Jesus being the rose!!! There is a depth to your blog that is profound!! Thanks so much for sharing!! If you ever offer classes or tutorials I would love to be included. Thank you so much for sharing your life with us =D I love your art and your handiwork as well as hearing about your family. Please love a cat for me and enter me in the draw for your pincushion. What a lovely piece of work., and lovely musical inspiration. 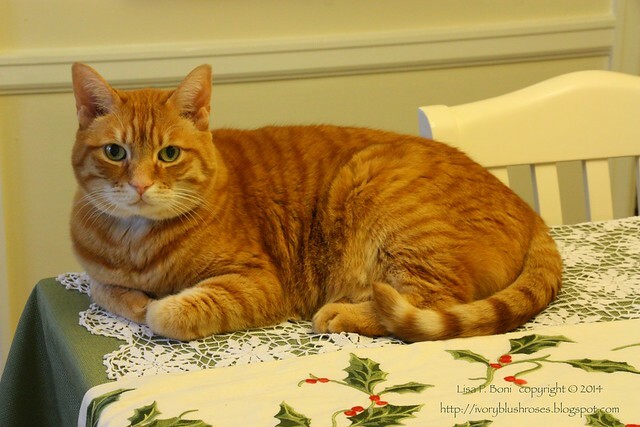 Thomas is a lovely Christmas decoration, and the tablecloth highlights his beautiful green eyes. Your house, trees and decorations are a treat for my eyes. Your pincushion is perfection, like they always are. Thank you for sharing so much beauty with everyone. God Bless you and yours. You know the true meaning of Christmas, the birth of Christ. You make my heart happy.